Beta Iota Chapter is proud to be recognized as a Jewel Chapter because we raise over $2,000 annually for the Alpha Gamma Delta Foundation. 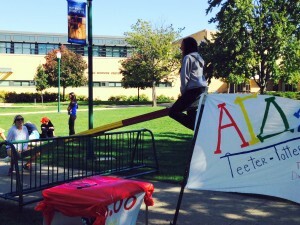 We raised this amount by having a 24-hour teeter-totter-athon and an auction at Parent’s Weekend. Alpha Gamma Delta members express concern for others through various philanthropic projects. Helping organizations and people in need is an integral part of Alpha Gamma Delta. Community service projects include helping with the 5th and 6th grade boys and girls basketball program at Jefferson School and volunteering for the PTA Jefferson Carnival. We also help pack food for a school district weekend back pack program and support local food pantries. Members also participate in other fraternity and sorority philanthropy events along with other community service groups and activities such as American Red Cross, Special Olympics,Charleston Food Pantry, food baskets at Thanksgiving, adopt a family at Christmas, and area nursing homes.